Home » Container Gardening » Elephant Seed Garlic » Hardneck Seed Garlic » Organic Gardening 101 » Organic Seed Garlic » Organic Seed Shallots » Seed Garlic » Softneck Seed Garlic » Urban Gardening & farming » Growing garlic—what’s the difference between softneck garlic and hardneck garlic varieties? 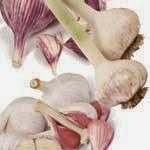 Growing garlic—what’s the difference between softneck garlic and hardneck garlic varieties? Growing garlic in your own garden lets you play with flavors you cannot find at stores. 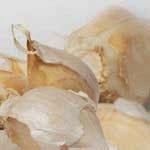 We carry more organic seed garlic than any other garden company, at the best prices, so plunge in and get garlicky. 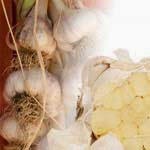 The nuts and bolts of growing and harvesting garlic are right here for you, in the Grow Organic How to Grow Garlic video and their downloadable Garlic Growing Guide. The question is, which varieties of garlic seed do you want to plant? Softneck or hardneck or both? By the time you see garlic in the store it has been trimmed, but there is still a papery tuft that stands above the bulb. That’s the covering of the “neck” of the garlic. Garlic also comes with different colored skins around the cloves. The cloves themselves are always a creamy white. This is the garlic you’ll find in most grocery stores. The bulb has a mild flavor. A great virtue of the softneck garlic (Allium sativum ssp. sativum) is that it stores very well. Since the necks are (literally) soft, you can cut them nice and long for braiding. A braid of garlic makes a winning kitchen gift for friends and family! Which to choose? California Early White has no hot bite in its flavor, grows rapidly and is ready to harvest early. If making garlic braids is your top priority, plant California Late White. You’ll get a stronger flavor with this garlic, and it does better in warm climates than the Early variety. Hardnecks (Allium sativum ssp. ophioscorodon) are closer to wild garlic, with complex flavors. These are the garlics that some compare to wines with subtle differences that reflect the regional soil and weather patterns. One simple benefit to the cook is the way some of their skins slip off smoothly. Hardnecks do not store as long as softnecks—cure them, eat them within 6-10 months, and get to know their distinctive flavors. Spanish Roja’s flavor in particular is rich and classic—it does have a shorter shelf life, of 3-4 months, so go ahead and enjoy this best seller early. This big guy is technically in the leek family, but you’d never know by the look or the taste. Kids love harvesting this giant of the garlic patch, and it keeps well too, with a mild flavor. Garlic keeps best at 32-40 degrees with a relative humidity of 60-70. If you need help keeping tabs on the temperature and humidity in your storage area, try the Humiguide Thermometer or Digital Indoor/Outdoor Thermometer. Still can’t decide? That’s why Grow Organic created a Garlic Combo Pack, to let you try a little of this and a little of that—at a bargain price! It’s a gastronomical delight featuring organic California Early White softnecks, organic Russian Red and organic Purple Italian hardnecks, a conventional Elephant garlic, and even some organic French Red Shallots for delicate flavors. Ron Engeland’s popular book, Growing Great Garlic is the ultimate guide for the organic garlic grower; in addition to practical advice, you’ll learn more about garlic in the Hanging Gardens of Babylon. For more information on garlic watch our videos on Growing Garlic and Garden Planning & Crop Rotation. Get the scoop on Music, their most popular of the hardneck garlics. Learn how to grow garlic and its allium cousins with their article on What to Plant in Your Winter Garden. Welcome to the World of Seed Garlic! Plant some garlic this year, keep track of what you like, and experiment with new varieties in the years ahead. Once you start growing garlic at home you’ll be spoiled by having your own cured garlic to cook with, in such a range of flavors.